In this second half of the decade, Peace Boat has launched seventeen voyages for peace, of which fourteen have been global voyages and the other three have been regional voyages in Northeast Asia. A further voyage will launch in April, and two more are planned for later in 2010. See the end of this report for a full list of the voyages undertaken since the beginning of the Decade. Onboard each of these voyages, the ship, as a neutral space beyond borders, becomes a floating peace village, encouraging a sense of community and enabling direct dialogue between those onboard and in the ports that we visit. Our programmes, both onboard and in port, explore the main aspects of Peace Boat's activities - peace, human rights, sustainability and respect for the environment - and aim to develop travel as a tool for peace and sustainability. Peace Boat visits an average of 15 ports on each global voyage. During our visits, typically one to three days in length, we develop various ways through which our overall objective of promoting peace and sustainability can find a concrete expression, locally and globally. The port is the place for us to build alliances and promote solidarity with different actors and at different levels of each society. Activities are jointly organized and aim to answer to the needs of our partners in each port at the same time as they become powerful mobilizing tools for the whole range of Peace Boat participants. Peace Boat's chartered passenger vessel, SS The Oceanic - featuring the logo of the United Nations Millennium Campaign symbolising Peace Boat's committment to creating a peaceful and sustainable world." An intensive peace and sustainability studies programme for participants onboard, combining advanced study of selected topics onboard the ship with exposure programmes in various countries. Our goal during each voyage is to provide participants with the insight and skills necessary to play an active role in education, activism and peace-building activities at the grass-roots level in their home countries and internationally. The programme is guided by special guest educators and specialists from Japan and many countries around the world. Among the wide-ranging topics of study are the conflicts in Israel/Palestine, the former Yugoslavia, Northern Ireland; historical reconciliation; sustainable globalization; the Millennium Development Goals (MDGs), nuclear disarmament, peace constitutions and climate change. Key developments in the last six years have been the completion of partnership agreements with for example Seisen University in Tokyo, SongKongHoe University in Seoul, South Korea, Tuebingen University in Germany and other universities – with more partnership agreements currently under discussion. Peace Boat aims to increase access to peace education and conflict resolution training to young people from regions affected by conflict through the International Student (IS) programme. We invite a select number of young people from opposing sides of conflicts to participate in an advanced conflict analysis and peaceful conflict resolution training programme, on a scholarship basis. As well as peace training, the international students help other participants onboard understand their lives and challenges, thus contributing greatly to the general participants' overall understanding of the nature of conflict. To date, students have come from for example Palestine, Israel, Serbia, Croatia, Cyprus, India, Pakistan, Northern Ireland, Colombia, the United States, Korea, China, and Taiwan. Peace Boat, through its GET Programme, organizes onboard English, Spanish and Japanese language programmes that allow participants to communicate more effectively with the people they meet onboard the ship and in port, with the philosophy that shared language and better communication are an important tool for peace. 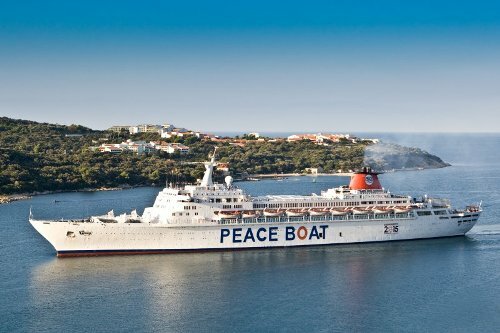 Peace Boat serves as the Secretariat for the Northeast Asia regional process in this global effort to highlight the role of civil society in the non-violent prevention of armed conflict and improve interaction between civil society, government and the United Nations in this field. Since its inception in 2004, GPPAC Northeast Asia (GPPAC NEA) has developed into a fully functional and effective cross-border network, made up of over 200 organizations and individuals. With focal points in 11 major cities throughout the region, GPPAC NEA carried out an extensive consultation process, and now holds regional consultation meetings. The Regional Work Plan of GPPAC NEA was symbolically launched in North Korea close to the DMZ and in Seoul in 2006. Peace Boat is primarily involved in activities together with regional and global members of GPPAC in the fields of awareness raising, media, peace education and interaction and advocacy. The Global Article 9 Campaign is a peace movement initiated by Peace Boat in 2005 in reaction to the debate over revising Japan’s pacific constitution. Indeed, Article 9 of Japanese Constitution renounces war and the threat or use of force as a means of settling international disputes; it also prohibits the maintenance of armed forces and other war potential. Since its launch, a strong international network of NGOs and individual has formed in support of the campaign that strives for a global peace that does not rely on force. As a major part of the campaign, Peace Boat has co-organized a number of international events to discuss the principles enshrined in Article 9 and have a dialogue over the role that citizens of the world can play to realize them through promoting peace constitutions, disarmament, demilitarization and a culture of peace. The large scale “Global Article 9 Conference to Abolish War” was held in Japan in 2008, as well as follow-up events in Costa Rica and Ecuador in 2009. Peace Boat was created in 1983 at the initiative of a group of Japanese students as a creative response to government censorship of the country’s past military aggression in Asia-Pacific. Indeed, Japan has failed to atone for its colonization and military invasions of neighboring countries and the human rights abuses and war crimes committed in this period. Thus, the teaching of history in this region is intensely politicized and divisive. To overcome a intensely politicized and divisive teaching of history and build mutual understanding, Peace Boat and the Green Foundation of Korea have organized regional voyages focusing on the historical reconciliation issues faced by the Northeast Asian region. During the second half of the decade, four such voyages took place, brouging together well over 2,000 Japanese and Korean citizens and creating a conducive environment for them to share their common vision of a peaceful and sustainable future for East Asia. In addition, Peace Boat has organized and participated in a number of events pertaining to Japan’s recognition of history and history education. Notably, Peace Boat sits in the the organizing committee of the Forum of Recognition of History and Peace in East Asia held annually, most recently in Tokyo in 2009. Furthermore, besides contributing to a region-wide initiative to write a common history textbook for the region, Peace Boat’s own Asian History Project Team has been lobbying the government over Japan’s revisionist textbooks and has been compiling booklets aimed at Japanese youth which tackle the suffering caused by the Japanese military occupations and highlight the viewpoints of other Northeast Asian peoples. Peace Boat Hibakusha Project is a unique civil society initiative aimed at influencing the nuclear disarmament debate and meant to contribute building a consensus towards the elimination of nuclear weapons through educating people about the human costs of nuclear weapons, engaging decision-makers and catalyzing support around the world. The project consists of inviting Hibakusha (survivors of the atomic bombing in Hiroshima and Nagasaki) to participate in around-the-world voyages to share their tragic experiences and call for a nuclear-free world. Peace Boat started working with Hibakusha in 2008 and has since organized three Global Voyages for a Nuclear-Free World, involving over 120 Hibakusha. Through the appointment of its senior staff and nuclear disarmament expert Kawasaki Akira to the position of NGO Advisor, Peace Boat closely followed the work of the Commission, participated in meetings and discussions, and made the link with international civil society, notably by bringing the voices of civil society to the ICNND and lobbying for the abolition of nuclear weapons. Since the Commission’s report was released, Peace Boat is advocating for the implementation of its recommendations. Throughout its work and its different programs, Peace Boat consistently spreads the “no military, no war” message and appeals for a demilitarized society. Based on Article 26 of the UN Charter that calls for the establishment of a system of regulation of armaments with the least diversion of the world human and economic resources for armaments in order to promote the establishment and maintenance of international peace and security, Peace Boat is advocating for a shift in the allocation of resources, namely a decrease of military expenditures and the reallocation of funds to eradicate poverty and invest in sustainable development and human security. In addition, Peace Boat participates in a number of international disarmament networks and coalitions, including the Geneva-based NGO Committee on Disarmament, Abolition 2000, Mayors for Peace, the Pacific Freeze, and more. Peace Boat has long been involved in local and global initiatives to eradicate poverty in the world. Particularly in recent years, Peace Boat has been actively carrying out projects towards the realization of the Millennium Development Goals (MDGs). Notably, in 2009, Peace Boat launched its MDGs Campaign, in partnership with the United Nations Millennium Campaign (UNMC) to raise awareness about the MDGs and the role of civil society in achieving these goals. One of the central part of Peace Boat MDGs Campaign is the MDGs Training Program designed to develop an understanding of the challenges faced in eradicating poverty and promote activism for achieving the MDGs. Participants in the program attend lectures and workshops with guest educators, including Asia Director of the UNMC Minar Pimple and Toko Tomita of the Hunger Free World Development and Advocacy Division in Burkina Faso and Benin. In addition, the first African Youth MDGs Forum was held onboard, in which youth representing ten countries including South Africa, Ghana, Malawi and Kenya discussed how young people can contribute to ending poverty and achieving the MDGs. The third dimension of the campaign is the artistic one, known as the MDGs Dance Project. It consists of performances meant to raise awareness about the MDGs and inspire actions towards the eradication of poverty. Symbolizing the strength of the collaboration between Peace Boat and the United Nations, the UNMC’s logo “End Poverty 2015” was painted on the body of the Peace Boat’s vessel. Sustainability has always been at the heart of Peace Boat’s concerns and activities. Throughout its voyages, Peace Boat consistently raises local environmental issues, looking at their impact on people at the local level, as well as on a global scale and stressing the importance of peace as a precondition for sustainability, as well as sustainability for a lasting peace. Peace Boat has been organizing environmental education programs, including during visits to the Antarctic and Andean regions. Vigorous advocacy and educational programs have brought participants face-to-face with local manifestations of global problems such as global climate change and the struggle to find solutions and effect positive change towards environmentally sustainable development. During the Latin American segment of voyages, representatives from the environmental movement in Uruguay, Argentina, Chile, and Salvador have come onboard to address the issues such as access to clean water, climate change, and the protection of nature in Patagonia to name just a few. Indeed in Patagonia for example, Peace Boat works closely with CODEFF, on of Chile’s oldest environmental organizations, to raise awareness about a controversial hydro-electric project that threatens to do ecological damage to the Aysen region, whose diverse wildlife and other biological and geographical features are already endangered by development and resource exploitation. Peace Boat has lent its voice to the call to register Patagonia as a UNESCO World Heritage Site, and helps fundraise for environmental activities in Chile. At the regional level in Northeast Asia, Peace Boat is collaborating with the Green Foundation, Korea’s largest environmental group to organize Peace and Green Boat Voyages that focus on sustainable lifestyles and address regional environmental issues. Among them figure for instance the environmental impact of the presence of US military bases in Okinawa, the threat posed by the nuclear reprocessing facility operating in Rokkasho, as well as the danger posed to wildlife and bird preservation by wetland reclamation and development projects in the Korean peninsula. Despite ongoing wars and violence around the world, we are witnessing progress toward a culture of peace and nonviolence during the second half of the decade. We have a historic opportunity to move forward particularly in nuclear disarmament, largely thanks to relentless efforts by civil society, as well as new high-level initiatives for a world free of nuclear weapons. World leaders are once again set on the discussion of nuclear non-proliferation and disarmament at the international level, precipitated by United Nations Secretary General Ban Ki-Moon’s ‘Five-Point Plan’ and President Obama’s initiative. Hoping for a breakthrough agreement in the upcoming Nuclear Non-Proliferation Treaty Conference or in the near future, a lot of NGOs and civil groups are making vigorous efforts to push for progress in the negotiations. As part of this cooperative effort, Peace Boat continues its disarmament education of the ‘Hibakusha Project’ – travelling the world with atomic bomb survivors and providing vivid testimonies of their experience with nuclear destruction to raise public awareness. Even in the broader spectrum of the peace movement, we have seen positive progress. The civil society network has been strengthened and different NGOs and organizations have shown growing solidarity on critical peace and security issues. For example, the Northeast Asia regional process of the Global Partnership for the Prevention of Armed Conflict (http://www.gppac.net), which Peace Boat serves as the regional secretariat, has played a critical role to develop a culture of peace in the region and actively engaged in various joint campaigns ranging from the development of peace education to the anti-foreign military base movement. The Cold War legacy is still persistent in governments’ security policies and prevents the implementation of a culture of peace and nonviolence. The old-fashioned logic of nuclear deterrence still lingers around and obstructs meaningful changes on the nuclear agenda. In the Northeast Asia region, negotiations over the issue of North Korea’s nuclear program are stalled and Japan, South Korea, and Taiwan remain under the US nuclear umbrella. Furthermore, the scale and role of US military stationing in the region has expanded, thus hampering the likelihood of building a better relationship among countries in the region. Moreover, the failure of the world’s governments to embrace the voice of civil society often delays or prevents more constructive changes to build a culture of peace and nonviolence. Therefore, mechanisms for democratic participation of civil society at the governmental and international levels should be developed in this regard. We will continue to actively take part in various peace movements’ campaigning, for nuclear weapons abolition, sustainable development and human security. In the long term, we will continue our ongoing programmes, including the Hibakusha Project, Disarmament for Development and the Global Article 9 Campaign, and GPPAC, in order to spread the culture of peace and nonviolence. A better coordination of activities in NGO networks needs to be put in place. The collective voice of civil society can play a better and more effective role in preventing conflicts and building peace. In addition, a strengthened cooperative mechanism between governments, NGOs, and international organizations will help to make a more inclusive and participatory policy-making process that can foster a culture of peace.